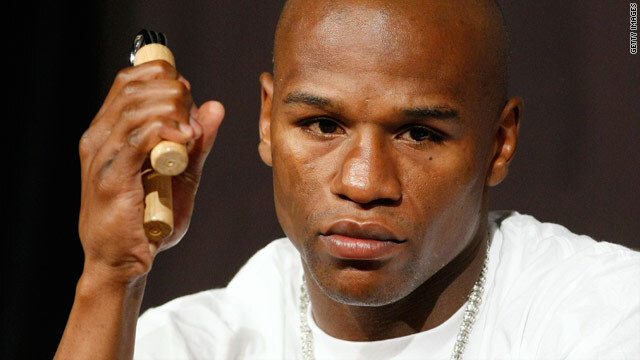 Floyd Mayweather Jr. believes he will defeat Manny Pacquiao when the two eventually meet next March. (CNN) -- Unbeaten American Floyd Mayweather Jr claims he will knock out WBO welterweight world champion Manny Pacquiao when the two boxing giants lock horns next year. Speaking on HBO TV's Joe Buck chat show, the 32-year-old Mayweather -- who has an unblemished record from 40 fights -- said: "Pacquiao's a good fighter but I've been around the sport a long time and I've dominated boxing for around 15 years now. "Nobody has defeated me yet so we'll have to see. The thing is, I don't want the fans to be really shocked by what will happen when we do happen to meet up -- because it's not going to be anything new for them." "The things is, Manny has been knocked out before and he's taken losses. I'll be victorious." Filipino Pacquiao will come into the fight following a remarkable 12 months which has seen him defeat de la Hoya, Ricky Hatton and Miguel Cotto. Meanwhile, Mayweather has fought only once in two years, a unanimous points victory over Juan Manuel Marquez in las Vegas. Although definitive plans for the mega-money contest are yet to be confirmed, a date of March 13 is widely rumored to be agreed, with three possible venues in the running to stage the contest. The two fighters are regarded as the best pound-for-pound boxers in the world right now and the fight is expected to generate record levels of interest, easily surpassing the previous record of $18.4m for gate receipts, which was generated for Mayweather's bout with Oscar De La Hoya in 2007. Two NFL stadiums are reported to be bidding to host the fight. Cowboy Stadium in Arlington, Texas, home of the Dallas Cowboys, is competing with the Superdome in New Orleans, as well as the MGM Grand in Las Vegas. The two stadiums could accommodate up to 100,000 spectators, while the MGM Grand seats about 16,000.